Vibrant Palette Arts Center (VPAC) fills a much needed void in the community to provide people with disabilities opportunities for learning, collaboration and artistic growth beyond the public education system and into adulthood. We provide supplies, studio space and arts education, and exhibit opportunities — allowing these artists to realize their full potential in a social atmosphere among peers, and even have the opportunity to share their work with the greater Seattle community. Your support is vital to our success — without you, we cannot make this a reality. We’ve got levels of support for every budget, and your donation is 100% tax-deductible. 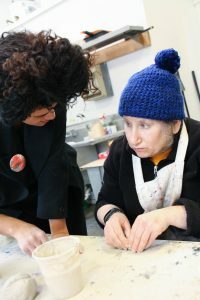 Artist Elizabeth Rogers learns ceramic techniques from Instructor Sharece Phillips. Vibrant Palette Arts Center, Inc. is a fiscally sponsored project of CascadiaNow!, a registered 501(c)(3) public charity. All donations are tax-deductible to the extent permitted by law. All funds raised by Vibrant Palette Arts Center, Inc. are received and become the property of CascadiaNow!.